How do you measure success when you hunt white-tailed deer? For many, the ideal is to bag a big buck with an impressive rack of antlers. 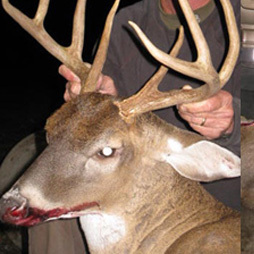 Those wily bucks have evaded hunters successfully for many years and pose an exciting challenge. For optimal conditions that are conducive to your success, make reservations at our lodge and on our land for SC deer hunting. We are proud to say the success rate among our hunters is high–more than 70 percent on bucks that are 2.5 years and older. We have plenty of well-maintained land that wildlife biologists believe is the best habitat for deer. Reach out to our staff to schedule your upcoming hunting vacation. Our owners have been providing hunters with great SC deer hunting opportunities since 1985. We have the ideal location – more than 3,000 acres near Fairfax, South Carolina. Deer are abundant on our property with a density ratio that is more than 200 deer per square mile. However, that is just the natural starting point. We do everything in our power to cultivate the land and encourage the health and abundance of the herd. This includes an unlimited, year-round feeding program, which keeps the whitetails on our land and nourishes them to grow big and strong. We also provide intensive management and oversight so this land is both haven and heaven for the deer herd. Feel confident about your SC deer hunting opportunities on our land, for we have improved upon Mother Nature to make this an environment where white-tailed deer flourish. Now, take these optimal conditions and add opportunity to the mix. We recommend the six weeks from early October to the middle of November, as well as a week in August, September, and December. Trust our experienced guides to take you to the best locations for SC deer hunting. Contact the staff at our hunting lodge in South Carolina to learn more about SC deer hunting. We serve hunters across the country, but are especially suited to folks along the I-95 corridor, including those from Florida, North Carolina, Virginia, Pennsylvania, Maryland, Massachusetts, New York, and Vermont.